your dinner guests saying..."More please". This vegan rum cake recipe is absolutely delish! We usually save this one for holidays and very special occasions. Hmmm...now that I think about it, every day might just qualify as a very special occasion! So go ahead - make some vegan rum cake and surprise someone tonight. What makes this is an extraordinary dessert is the flavor of the rum which is infused not only throughout the cake but through the glaze as well. Yum! 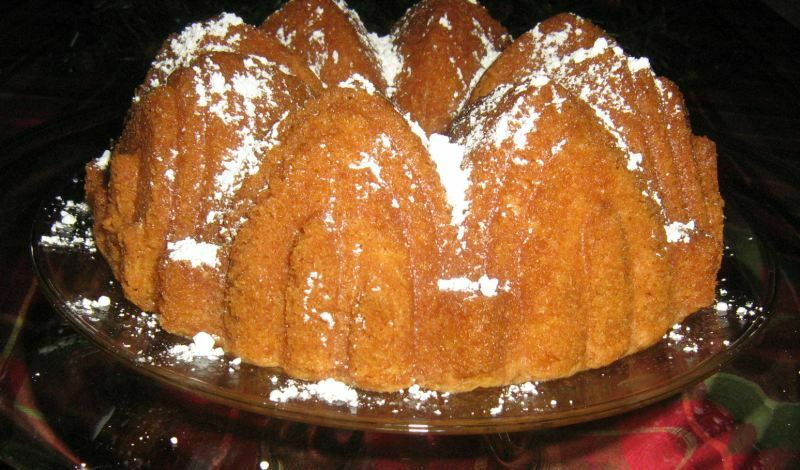 If you're having a dinner party or just having a few guests for coffee and dessert this rum cake will make them swoon. Yes, I said it - swoon. Anyway, it is so delicious you just have to try it! Mix all the ingredients together in a large bowl and beat with a fork or wire whisk for about ten minutes or until batter is smooth. Spray baking pan with bakers-spray and pour mixture into pan. Bake at 350° for 45 minutes until cake is golden brown on top and firm to the touch. Remove from oven, cool for about 5 to 10 minutes, turn out on serving plate. To prepare the glaze, combine ingredients in a medium saucepan and bring to a rolling boil on the stove. Slowly pour the glaze over the top of the cake. Take your time - it should take a few minutes. For the best results allow the cake to stand overnight so the glaze has a chance to crystallize. You may choose to also sprinkle the top with a modest amount of powdered sugar for effect. * If using a prepared or packaged cake mix, read cake package ingredients carefully - not all cake mixes are vegan.